Canadian Network on Humanitarian History » When Historians Meet Aid Workers and Policy Makers. Inside the Robertson Room, before the start of the conference. Each of the featured speakers presented their research to the conference, which was broken down into six different sessions over the period of the two days. In some remarkable capacity, each speaker reminded us of why history is important to policy making, and that regardless of the failures of some of Canada’s aid policies, its humanitarian aid program remains incredibly important to make sense of current dilemmas and traditions. 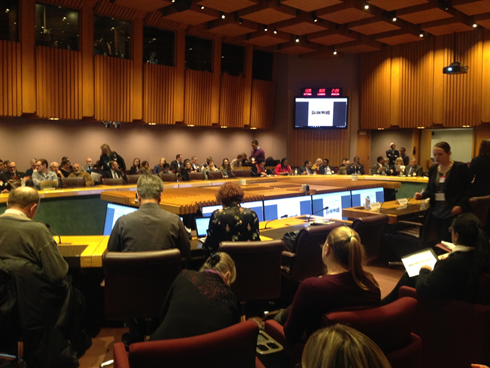 In the early afternoon of December 12th, the conference attendees gathered in the Robertson Room at Global Affairs Canada to explore new ideas and conversations about Canada and its historic role in the realm of humanitarian aid. While many attendees recognized colleagues and familiar faces in the auditorium, many others simply found their seats, anticipating the new knowledge that was to be shared over the next day and a half. After the chair welcomed guests to the first session of the conference, all of us settled into our seats, and pulled out our computers and note pads to record the interesting things that we were to learn. The first remarks of the conference were given by Peter M. Boehm, the Deputy Minister for International Development. In his speech, Boehm explained to the attendees that it is essential to consider the significance of history and its effect on policy makers. He remarked the importance of history in policy not just to simply avoid the mistakes of the past, but also when considering the context of past decisions that were made, so as to accept that knowledge shapes how governments make policies moving forward. In providing an explanation of some of the challenges of the past, and outlining the obstacles of the future, Boehm gestured to Minister Marie Claude-Bibeau’s mandate, and the international assistance review that she will be holding before the end of her term. After Boehm’s speech to the colloquium, a series of academics spoke on their respective research areas, and presented to us their concise, organized, and intriguing arguments on Canada’s involvement in humanitarian aid. The first academic to speak was Stephen Brown from the University of Ottawa, and he discussed generally the historic path of Canadian policy. In Brown’s presentation, Spicer’s book was central to the discussion of Canadian foreign aid, and he explored the goals of Canada’s aid policies, and the question about what the optimal relationship is between Canadian policy, and policies of other international actors. His words left us to ponder not only the importance of Spicer’s perspective, but also bigger questions about Canadian aid that are extremely relevant moving forward with the present context. After this short break, Jill Campbell-Miller from St. Mary’s University returned to discuss Canada’s role in the Colombo Plan, paying special attention to its involvement with India. Afterwards, David Webster from the Bishop’s University discussed the development of Canada’s relationship with the United Nations’ technical assistance program, and the extent to which Canadian diplomat Hugh Keenleyside helped foster Canada’s role within this international development initiative. Greg Donaghy form Global Affairs Canada was the last to present in this session and on this day, and his remarks focused heavily on Canada’s pre-CIDA aid initiatives. Although he argued that before CIDA the aid program was inefficient, he explored the influence that which aid administrators responsible for the department had on the program, with a focus on the work performed by Nik Cavell. The end of the session saw a question period where delegates around the room had the opportunity to ask questions about and challenge the ideas presented by the speakers. During this conversation, Donaghy, one of the three organizers of the conference, demonstrated that moving forward, we need to look back to the practical and political lessons that can be found in the tale of pre-CIDA humanitarianism, so as to better our system moving forward. The conversation, I found, was thrilling. 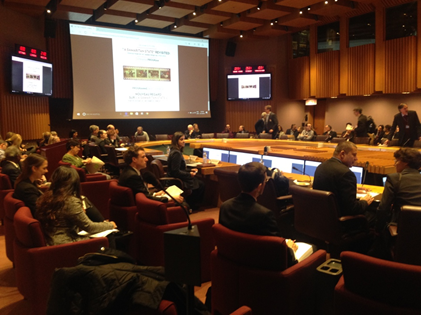 Maybe a hundred scholars were in the same room, and I had the opportunity to sit back and listen to the debates that they had over the details, purposes, and consequences of Canadian policies. The question period exposed me not only to a variety of opinions and details about aid policy, but also to the realities surrounding the life of scholarly research. The next session opened at 9am the following day – on Tuesday, December 13th. Attitudes remained enthusiastic as they were the previous day, and the number of attendees remained incredibly high. It was clear to me that everyone was enjoying the conference, and that they were anticipating the new sessions of that day. The first speaker of the day was actually Greg Donaghy again, as he provided a brief summary of Waterloo University Ryan Touhey’s research paper, titled, The limits of air: tensions in 1960s Canada-Pakistani Relations. The second presentation of this session featured Matthew Turgen, who provided a brief summary of Nippissing University Professor, Robin Gendron’s work, which explores, as the title indicates, Canadian mining interests in Guatemala and Indonesia in the 1970s and 80s. The third presentation of the day was a little different than the others given at the colloquium, as Sonya de Laat provided the conference with historical perspectives of CIDA’s visual culture through a subset of CIDA pictures housed at Library and Archives Canada. Her presentation, which I found to be immensely interesting, was titled, Pictures in development: Exploring the history and image of CIDA through its visual culture. It illustrated the differences between “the expected” and “typical” humanitarian aid photos, and the realities behind the work that are reflected in somewhat “unanticipated” photographs. Her presentation was rooted in the findings that she had gathered from examining an astonishing 8000 pictures collection, (taken between 1982-1985) that were from 36 different countries, by 20 different photo journalists and photographers. Although she had uncovered that there were more commonalities across the world than there are disparities, her research led to different questions about whether or not “typical” development photos actually conceal the realities behind development work. All of these presentations opened my eyes to the different areas of research in which humanitarian aid encompasses, and demonstrated to me that questions about history and policy can be found in places other than policy reports and briefings filed away by government officials. It showed me that fascinating information can be uncovered through exploring unexpected avenues, and that it is true that often times, research only leads to more questions about the subject at hand. The rest of the conference included presentations by Dominique Marshall, Ted Cogan, Kevin Brushett, Stefano Tijerina, Asa McKercher, and Nassisse Solomon. Later, we also heard from Laura McDonald, David Black, and Pierre Beaudet. Each and every one of the academics presented important information that further engaged the attendees in a series of question periods. At the beautifully catered lunch, I heard nothing but praise about the organization and quality of the event. Although it was my first academic colloquium and I knew virtually nothing about the specifics of Canadian humanitarian aid policy, the conference exposed me to a new realm of research and academic discussion that I found to be exhilarating. Having the unique opportunity to sit in a room of 150 academics, bureaucrats, and diplomats was truly an experience that allowed me to discover new areas of study, with unique perspectives. The Q&A sessions further illustrated to me the variety of experiences that the different academics at the conference had, and the ways in which all of their works overlapped in some shape or form. All in all, the conference was enlightening as much as it was thrilling, and I can’t wait to return to the next conference put on by Global Affairs Canada so I can learn more about Canada’s past endeavors and programs, and the ways in which that these can help develop the future of Canadian humanitarian policies. I would like to sincerely thank everyone who made this conference possible. Thank you to Global Affairs Canada for hosting us, and thank you to the chairs who made themselves available to help moderate the conversation. Thank you to all of the attendees for coming out, and to all of the speakers who shared with us their fascinating research. Finally, I would like to give a special note of thanks and congratulations to organizers Greg Donaghy, Dominique Marshall, and David Webster for working tirelessly to ensure the success of this event. Julia is a third year student at Carleton University majoring in History and minoring in Political Science. Her Research Assistantship is financed jointly by the CNHH and the I-CUREUS program of Carleton’s Discovery Centre. This was the first scholarly conference she attended. She is responsible for the photographs reproduced here. Sonya de Laat and Dominique Marshall, 2 December 2016, blog post, “Treasures of CIDA’s 30-Year-Old Photography Collections: A Visual Perspective on Canadian International Aid,” Canadian Network for Humanitarian History Blog. http://aidhistory.ca/treasures-of-cidas-30-year-old-photography-collections-a-visual-perspective-on-canadian-international-aid/.